I’ve told my husband that if there was ever a house fire or natural disaster and I only had a few minutes to grab stuff out of the house and flee, I would take my computer (and hard drives with all of our photos and memories) and our Mount Fuji climbing sticks. The saying “He who climbs Mt. Fuji once is a a wise man; he who climbs it twice is a fool” definitely rings true for me. Climbing was an amazing experience (on of my favorite ever! ), but the memories of the pain of the steep descent and the stiff hobbling in the week that followed are still burned in my brain and I will most likely not be climbing a second time. 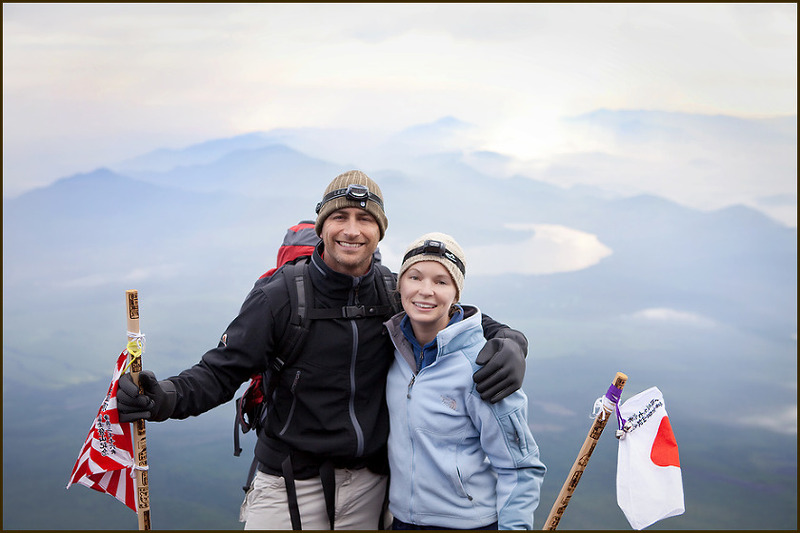 Jason and I wanted to do something special for our 4 year anniversary, and climbing Mt. Fuji was the perfect choice! At the time, we lived in Okinawa, so it was just a 2 hour flight to Tokyo and then a series of bus and train rides to the town that marks the start of the climb. We went in July, the first month of the “climbing season” where the weather is the most temperate. We decided to arrive at dusk and climb through the night and get to the summit just before sunrise. We were fresh and full of energy as we began the hike, prepared with all of our layers, backpacks, and headlamps. Our hiking sticks that we had purchased in town were nearly bare of stamps. as we walked along the wooded trail at the lower part of the trail, a fog descended over the darkening landscape and we heard the eerie sound of a horn blowing in the distance. It was so peaceful. It was so exciting to come upon the first hut just as the sky was really beginning to fade to night. An ancient lady sat by the open fire and carefully applied the metal brand to our staffs, leaving the burned impression. We stopped at every hut for a brand as we ascended the mountain, save two that we missed, and we made sure to catch those on the way down so there would be no gaps on the staffs. 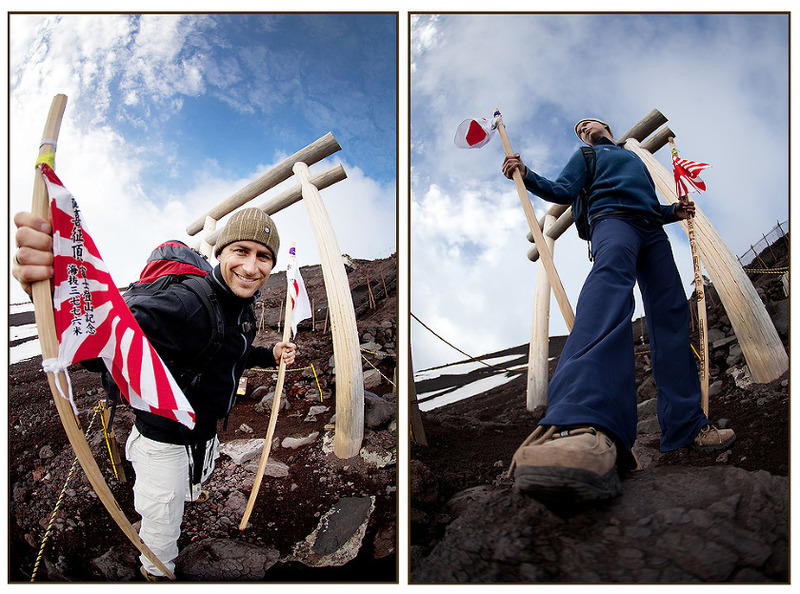 At one of the huts, we stopped for a while and had some delicious ramen for dinner, and then we continued climbing. At this point, we saw very few people on the trail, so climbing up the ridges it felt like it was just the two of us and the silence of the moon and the stars. Magic. The hike was definitely more challenging than I expected. We had to scale boulders and pick our way through some difficult volcanic rock fields. The staffs got a lot of use! We got most of the way to the top and had a couple of hours to go before dawn, so Jason and I decided to pay to stay in a bunk at one of the huts and get a little sleep. Two hours later we tumbled down from the cramped bunks and began the final climb. At this point the altitude was really getting to us, and the going was slow. A few steps and then a stop for breath. The breaks became more and more frequent. As we approached the the top of Mt. Fuji, the trail began to get much more crowded. We were basically in a slow line to the summit. When we saw that the sun was coming up and the path above us was shrouded in white mist, Jason and I stopped short of the summit for a photo. Then, passing through the Tori gates we pressed on to the peak. The descent was much less enjoyable than the journey up. It was incredibly steep and full of endless switchbacks and killer on the knees! Even though I was in marathon shape, I felt like a weakling watching the old people and school children cheerfully passing us on their way up as I torturously limped my way down. We descended as fast as we possibly could, hoping to make the 10am bus back to Tokyo and we made it with 5 minutes to spare! A once in a lifetime experience…I will cherish the memories.